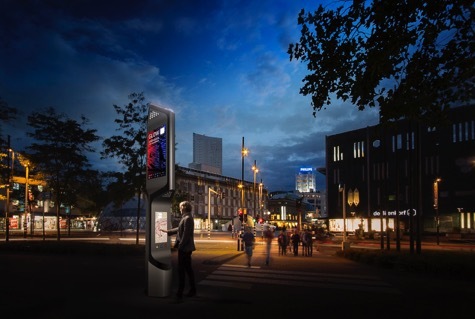 In the beginning of 2016 in the centre of Eindhoven, a new generation of intelligent street furniture will be installed: Citybeacons. The approximately four-meter high ‘City beacons; connect security, information and communication via an intelligent platform with the residents, visitors and businesses of the city. The Citybeacons will be a replacement of the advertising information display units (mupi’s) that stood in the centre until a few years ago. With the arrival of 15-25 Citybeacons in the city centre of Eindhoven, residents, visitors and businesses will get access via the digital platform to a number of digital and interactive functionalities. The Citybeacons will be placed (depending on the permits and infrastructure available) from the beginning of 2016 at different locations in Eindhoven city centre. The Citybeacon platform is also open to external parties. Cities can share relevant city information. Citybeacons generate user data such as air quality, traffic, social media data and for instance visitor numbers. The platform offers social features such as sending (public) messages facilitating a city tour or various game elements that relate to an event. Citybeacon reports that after Eindhoven several (inter)national cities will follow. Each city can choose which functionalities should be operational. The platform acts as a distribution point for collaboration with content providers and creative community that can respond to the opportunities and possibilities of this city landmark.